As mentioned on previous posts MRI works because a proton in a strong magnetic field will polarize. We use it to image hydrogen along with a collection of isotopes (somewhat irregular configurations of matter where the nucleus has an unusual number of protons or neutrons). However, other than hydrogen, magnetic resonance has not been reported in all the remaining elements (just isotopes). But in MRI we are typically merely imaging protons which occur naturally in all elements and isotopes. Why is it that we observe no magnetic resonance phenomena in the elements? (except for hydrogen). I think it is helpful to remember that elements and their nuclei are known to be quite stable. The strong forces between the sub-atomic particles provide nuclear stability. These forces can be so strong that an extraordinarily large electromagnetic field would be required to polarize one of the protons. The simplest element that is not known to exhibit magnetic resonance is helium. 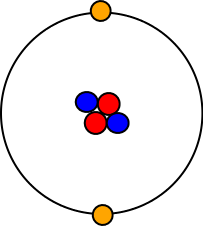 The 3 quark model also describes the neutron (blue in the nucleus of the image at the top) as two negatively charged down quarks and one positively charged up quark (no net charge). Since protons and neutrons are very close to each other in the nucleus, and since we know that the protons and neutrons can be made up of two different configurations of quarks, it could also be possible that the stable state of the nucleus of an element is due to a particular orientation of its proton's and neutron's quarks. The strong force is known to be extremely strong at these distances within the nucleus. Since we have a total of 6 positively charged up quarks in the nucleus it would make sense for the strong force to attract them all towards each other. Then perhaps they enter into a stable (or semi-stable) configuration with positively charged up quarks attracted to each other and thus in the centre of the nucleus. Negatively charged down quarks would then be further away from the nucleus' centre. Perhaps the reason no magnetic resonance (bell ringing) has been observed among elements (only hydrogen and isotopes) is because we are not using high enough magnetic field strengths to polarize the protons to the main magnetic field as opposed to the natural polarized orientation within the nucleus.